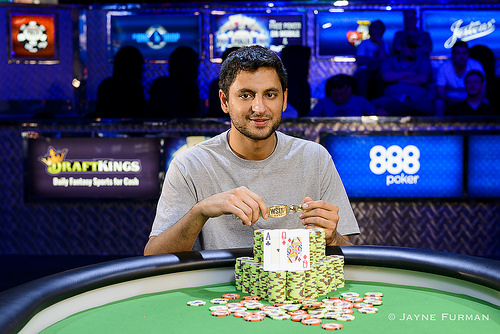 Las Vegas (June 11, 2015) — Ben Zamani carded his first World Series of Poker gold bracelet victory Thursday at the Rio All-Suite Hotel and Casino in Las Vegas. The win, which came in a $1,500 no-limit tournament, earned Zamani $460,640 as well as avenged a runner-up finish he carded less than a week ago in a $1,500 shootout event. With his spot in the winner’s circle cemented, Zamani now owns two cashes at the 2015 Series totaling more than $600,000 and vaulting him into Player of the Year contention. Much like his previous runner-up finish, Zamani held control of the $1,500 event during its late stages. This time, though, he didn’t let it slip. On the final hand, he caught heads-up opponent Natasha Barbour in a bluff. Barbour moved all in with nothing but 10 high and Zamani called with trip aces. The river came and went and Zamani, on the verge of tears, left the ESPN main stage in disbelief. His rail later explained the passion Zamani has for the game, how much the bracelet means to him and how devastated he was following the runner-up finish a few days prior. Having reached his crowning achievement, there was nothing left for Zamani who politely posed for winner’s photos along with some of his loyal railbirds. Zamani is 28 years old. 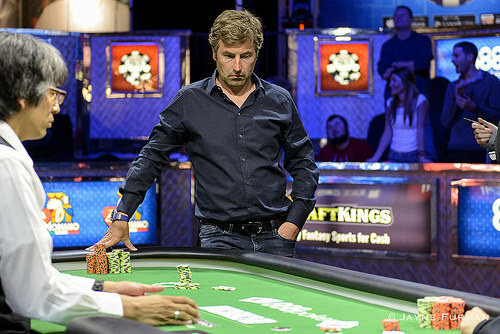 Though born in Germany, he is American and resides in Boca Raton, Fla. His most-recent deep run marks his 14th and largest WSOP cash. Event #20 was the 20th of 68 bracelet events on the 2015 WSOP schedule. The tournament’s 1,844-player field marked an attendance increase of more than 15 percent year-over-year. In all, the prize pool totaled $2,489,400 and paid the top 198 players. Notable in-the-money finishers include four-time WSOP Circuit ring winner Caufman Talley (10th, $26,337), two-time gold bracelet winners Andy Frankenberger (14th, $20,786) and Greg Mueller (102nd, $3,385), Chris Lindh (34th, $11,003), bracelet winner Taylor Paur (42nd, $9,111), six-time Circuit ring winner Valentin Vornicu (64th, $5,551), Matt Affleck (83rd, $4,231), Melanie Weisner (97th, $3,783), Joe Kuether (139th, $3,061) and Shannon Shorr (154th, $3,061). The tournament played out over a four-day stretch with the latter half of the final table consuming all the action on Day 4. At the day’s start, five players remained in contention including two-time WSOP final tablist Kevin MacPhee (fourth, $142,070) and Barbour, who hoped to become the first female gold bracelet winner of the 2015 WSOP. Ben Zamani’s official WSOP player profile page is available HERE. Final results, live reporting log, photos and official winner photo are available HERE. Live stream archive of the event is available HERE. Natasha Barbour calls from the small blind and Ben Zamani makes it 710,000 to go from the big blind. Barbour announces a reraise and makes it 1.6 million total. Zamani snap four-bets as he says "two point nine". Barbour grabs a stack of chips and then calls. There's nearly six million in the pot in what is sure to be the defining moment of the tournament. The flop comes and Zamani quickly pushes forward some chips for a bet of 950,000. Barbour snap-calls. The turn is the and Zamani taps the table softly. Barbour thinks for a moment and then announces that she is all in. Zamani holds up his cards and turns them over as he announces a call. Zamani has trips, and Barbour is drawing dead. The dealer puts out the on the river and Zamani's rail rushes him to celebrate the victory. Natasha Barbour finishes in second place, winning $284,911. 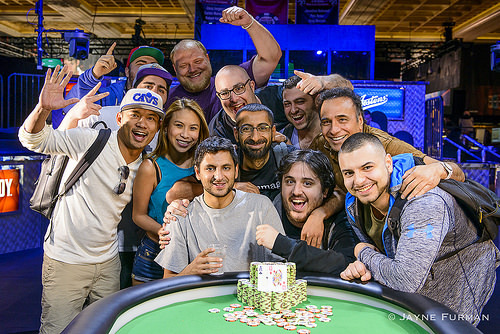 Congratulations to Ben Zamani who wins his first WSOP bracelet! This comes right on the heels of a second place finish earlier this WSOP in the $1,500 No-Limit Hold'Em Shootout. He takes home $460,640 for his win here today. Ben Zamani calls from the small blind and Natasha Barbour checks her option from the big blind. The flop comes and Barbour check-calls a 215,000 bet from Zamani. The turn is the and both players check. They check again on the river and Barbour takes the pot down with for a pair of sevens. Natasha Barbour opens to 425,000 and Benjamin Zamani calls, with the flop coming . Zamani check-calls Barbour's 550,000 c-bet and both players tap the table on the turn. The river comes and Zamani checks for a third time, prompting a bet of 550,000 from Barbour. Zamani calls instantly and tables for the low end of a straight. Benjamin Zamani opens to 385,000 and Natasha Barbour defends her big blind to see the flop fall . Barbour check-folds to a 460,000 wager from Zamani. Natasha Barbour opens to 425,000 and takes down the blinds and antes. Benjamin Zamani limps in and Natasha Barbour checks her big blind option. The flop is and Barbour check-calls a bet of 165,000 from Zamani. Both players check the turn, and Zamani takes it down with a bet of 400,000 after the falls on the river. Cards are Back in the Air! Back in action here in the Mother Ship! With ten minutes left in the level, the two remaining players have decided to take the 20-minute break a little early. Play will resume shortly with Benjamin Zamani sitting on 7,100,000 for a slim lead over Natasha Barbour's 6,700,000. Natasha Barbour raises to 320,000 from the button and Paul Ephremsen calls from the small blind. Ben Zamani folds out of the big blind. The flop is and both players check. The turn is the and Ephremsen leads out for 375,000. Barbour raises to 800,000 and Ephremsen announces that he is all in for a total of 1,865,000. Barbour instantly calls. Ephremsen flops top pair but he is behind as Barbour has the over pair with her kings. The river is the and Barbour's rail celebrates as the tournament is now head-up. Paul Ephremsen is eliminated in third place for $196,986. Zamani and Barbour are nearly dead even in chips with Zamani holding a slight chip lead. Ben Zamani raises to 360,000 from the button and wins the blinds and antes. Ben Zamani calls from the small blind and Natasha Barbour checks from the big blind. The flop is and both players check. The turn is the and Barbour folds to a bet of 205,000 from Zamani. Ben Zamani gets a walk in the big blind. Ben Zamani opens from the button to 355,000. Natasha Barbour thinks for a little while but folds. Paul Ephremsen calls from the big blind. The flop comes and Ephremsen check-calls a 390,000 bet from Zamani. The turn is the and both players check. The river is the and Ephremsen leads out for a million even. Zamani calls. "Ace," says Ephremsen as he tables . "No good," says Zamani and turns over for a pair of eights. Paul Ephremsen folds his button, Benjamin Zamani opens to 410,000 from the small blind, and Natasha Barbour defends her big blind with a call. The flop is and both players check to take the on the turn. Zamani tries a 330,000 wager but he releases after Barbour raises to 1,100,000. Natasha Barbour opens to 320,000 from the button, but Paul Ephremsen takes the pot down with a three-bet to 830,000. Paul Ephremsen gets a walk in the big blind. Paul Ephremsen limps in from the button, Benjamin Zamani surrenders his small blind, and Natasha Barbour checks her big blind option. The dealer fans the and Barbour check-calls a bet of 275,000 from Ephremsen. Both players check down the turn and river, with Barbour's for a pair of sixes better than Ephremsen's for bottom pair. Natasha Barbour opens to 320,000 holding the button, Paul Ephremsen calls from the small blind, and Benjamin Zamani does the same from the big. On the flop Ephremsen checks over to Zamani, and he bets 215,000. This forces two quick folds and Zamani takes it down.